Events and Seminars are located on a separate page (see link in the menu to the left). 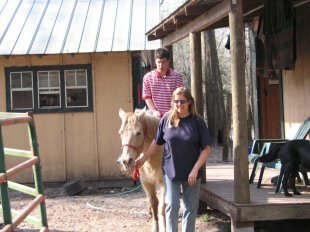 Cypress Run Farm is pleased to be able to provide Equine Assisted Psychotherapy and Equine Assisted Learning (EAL). Uta Peters has been certified by the Equine Assisted Growth and Learning Association (EAGALA) as an equine specialist, and will be working with Jo Barksdale, Licensed Clinical Social Worker to address treatment goals of clients in EAGALA sessions. For further information, please contact Jo Barksdale at jobarksdalelcsw@gmail.com or Uta Peters at appaloosadreamer@cypressrunfarm.com. The focus of EAP and EAL is to address a variety of mental health and human development needs including behavioral issues, depression, anxiety, relationship problems and communication needs. All EAGALA sessions are on the ground with horses (no mounted work). No prior knowledge of horses is required. EAP is experiential in nature. This means that participants learn about themselves and others by participating in (experiencing) activities with the horses, and then processing (or discussing) feelings, behaviors, and patterns. This approach has been compared to the ropes courses used by therapists, treatment facilities, and human development courses. An added advantage of EAP is the utilization of horses in the therapy--dynamic and powerful living beings. You may ask, "Why horses?" Horses are large and powerful creatures, permitting clients to overcome their fears and develop confidence in themselves. Completing a task with a horse, despite the fears one my have can create sucsessful experiences that help one meet the daily challenges of everyday life. As discussed in Natural Horse Boarding, horses are very much like humans in that they are social animals. They have defined roles within their herds. In most cases they would rather be with their peers. They have distinct personalities, attitudes, and moods. What works with one horse, may not work with another. Horses can be downright stubborn and or defiant. It is this very behavior that provides an opportunity for metaphorical learning, an effective technique when working with even the most challenging individual and/or interpersonal problems. We invite you to look into this new approach to dealing with a variety of mental health and human development needs. Uta Peters has found some of her most gratifying work at Cypress Run Farm involved working with riders having various handicaps. It is a well known fact ,that 'the outside of a horse is good for the inside of a human'. However, statistics prove the tremendous impact horseback riding can have on strengthening the muscles of individuals with issues like Cerebral Palsy, etc. Through her father's interest in this field; his being an Orthopedic surgeon and specialist in Sports Medicine who started the first program of its kind in Birkenreuth, Germany in the 70s along with another MD, Uta Peters has been connected to Therapeutic Riding since childhood. 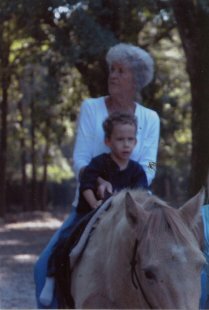 For many years now Uta Peters has offered Riding Therapy at Cypress Run Farm to interested individuals and their families. She would encourage you to ask your physician's advice if Riding Therapy would benefit your family member prior to starting the program. There are several horses that are suitable for this kind of work. While not offerring hyppotherapy, the services Uta Peters provides with riding therapy address many of the same deficits in language, sensory processing and reading social cues that children with autism experience. Being on a horse addresses many of these needs. The horse provides strong sensory stimulation to muscles and joints (called proprioception), impacts the balance and movement sense detected by sensory receptors in the inner ear (called the vestibular system) and provides varied tactile (touch) experiences as the rider hugs or pats the horse. The pictures of the young man (below) are of our son, who has autism. 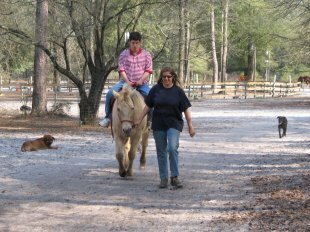 Bernie has been receiving riding therapy from Ms. Uta for over three years, and it is one of the highlights of his week. Uta Peters is extremely patient with our son, and has worked with him to make the therapy a pleasurable experience for him. We would highly recommend Uta Peters if you are interested in receiving similar services for your child.